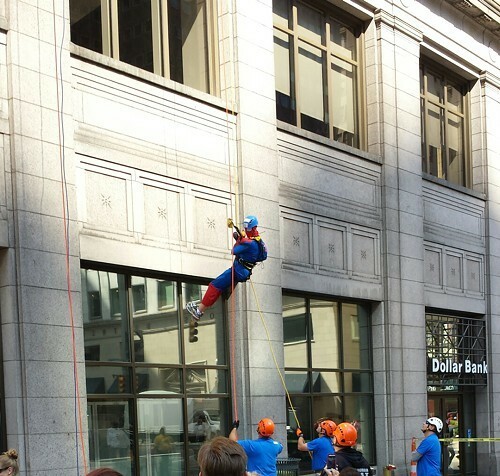 Earlier today, Wonder Woman, Superman and Spider-Man rappelled down a 25-story skyscraper in Downtown Pittsburgh to raise funds and awareness for Our Clubhouse, a cancer support organization. "This is nothing compared to the battle cancer patients go through on a daily basis," said Kevin Bright, a three-year fundraiser for Our Clubhouse who dressed up as Spider-Man. 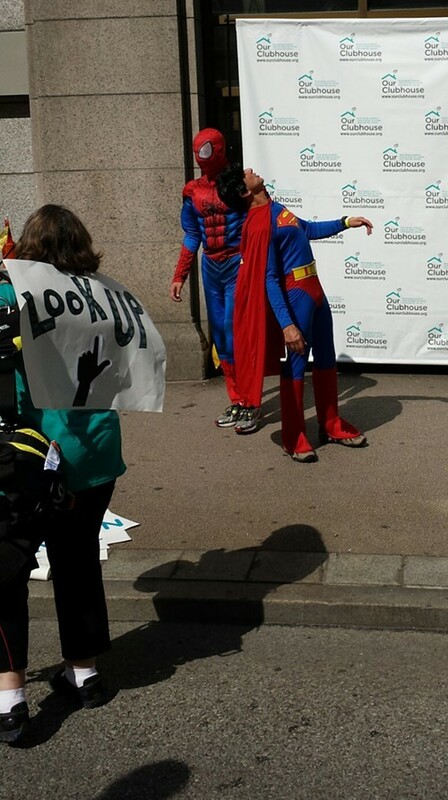 The three individuals dressed as superheroes were among 60 who rappelled down the Oliver Building today. The individuals were required to collect $1,500 in pledges in order to participate. As a result of their efforts more than $150,000 has been raised for Our Clubhouse. "Our Clubhouse does wonderful things for people touched by cancer," said the Wonder Woman-costumed Katie Vargo after completing her descent. "Anybody whose gone through cancer knows it's a difficult time so I'm very happy to help." Our Clubhouse provides emotional and social support services to those diagnosed with cancer, and family and friends who have been effected. Bert Dorazio, who donned a Superman costume for his descent, was diagnosed with cancer in 2010. He'd begun volunteering with Our Clubhouse prior to his diagnosis and has worked with the organization for nearly seven years before being elected to the board this year. "It's just a wonderful organization," Dorazio said. "I wanted to do something to show support for the fine work they're doing." Formerly Gilda's Club of Western Pennsylvania, this year the organization changed its name to Our Clubhouse. Since opening in 2006, the organization has served more than 2000 individuals. "We really wanted to raise awareness for our new name and get our name out there so that people know about the free services we offer to anyone in South Western Pennsylvania," said Teddi Horvitz, director of development. "So we thought this would really make a big splash."